I returned to New York City a month later after landing a May solo show at the famed gallery “Pop International” in SOHO. I wanted to revisit the city not only to reconnect to the curator/owner over there, but to continue the inspiration in my head that seemed to be exploding back and forth like a pinball in rapture. I had already completed “Mr. Busy Head”, the 2nd of Metropolitan series about New York City, but this time my visit was to focus on the Contemporary Modern series by revisiting the Whitney to see Steve Wheeler’s work, as well as the Guggeheim’s collection of Kandinsky and Picasso. While in my friend Michael’s apartment on the upper west side on Central Park West and 75th, I sat there with a partially finished abstract expressionist piece focusing on Steve Wheeler’s “Laughing Boy Rolling”, and became slightly bored with the fact that everything had already been drafted and color coded. I felt doing any more work on the piece, now that it had been laid out, would have just been filler. I decided to roll up the canvas and store it to finish in my studio in Los Feliz (Los Angeles, CA). I grabbed a new canvas and started staring blankly at the piece. I wanted to create something spontaneous…. something stream of consciousness that would be completely done in New York City. I grabbed colors here and there and just started working on the piece which rested on a side table in the living room. I started thinking beyond just geometric shapes… (which is what I will ALWAYS initially gravitate towards). After laying a coat of warm colors down on the face, I decided to work on mixing the matte acrylic down and using the tip of my brush to flicker paint on the face. At the same time I was doing this, I was hearing on NPR about the recent news about “Alpha Centauri” and this discovery of a new planet in its binary star system. While the broadcaster was talking about this, I began to parallel how stars in the sky always looked like Jackson Pollock masterpieces. 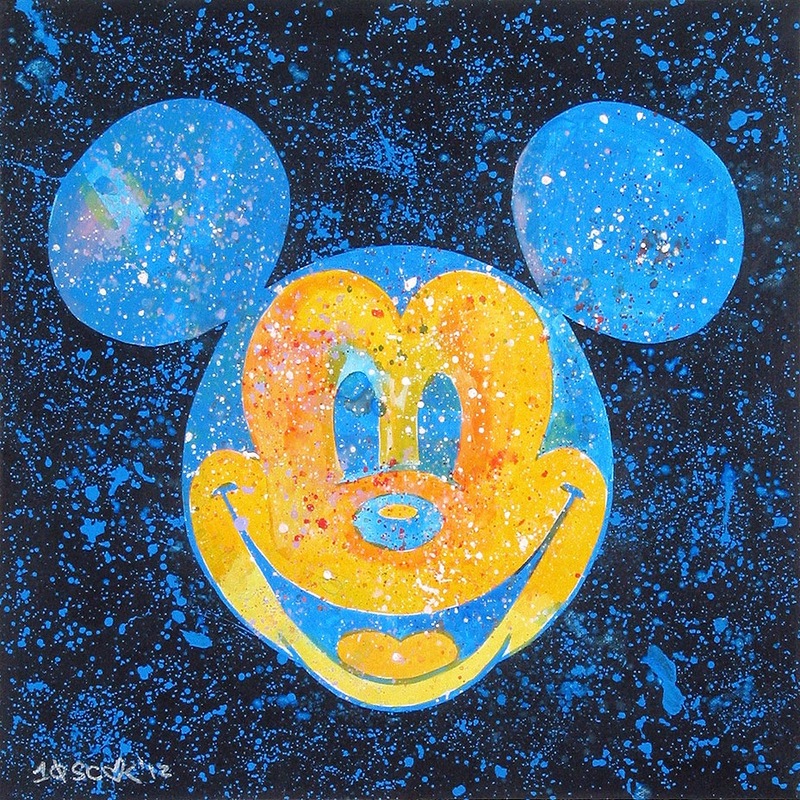 I decided to tape up the Mickey and do a night sky with stars splattered against its surface in relation to the news. The sun rose and set in the New York City sky that day, and I don’t think I ever left the apartment. 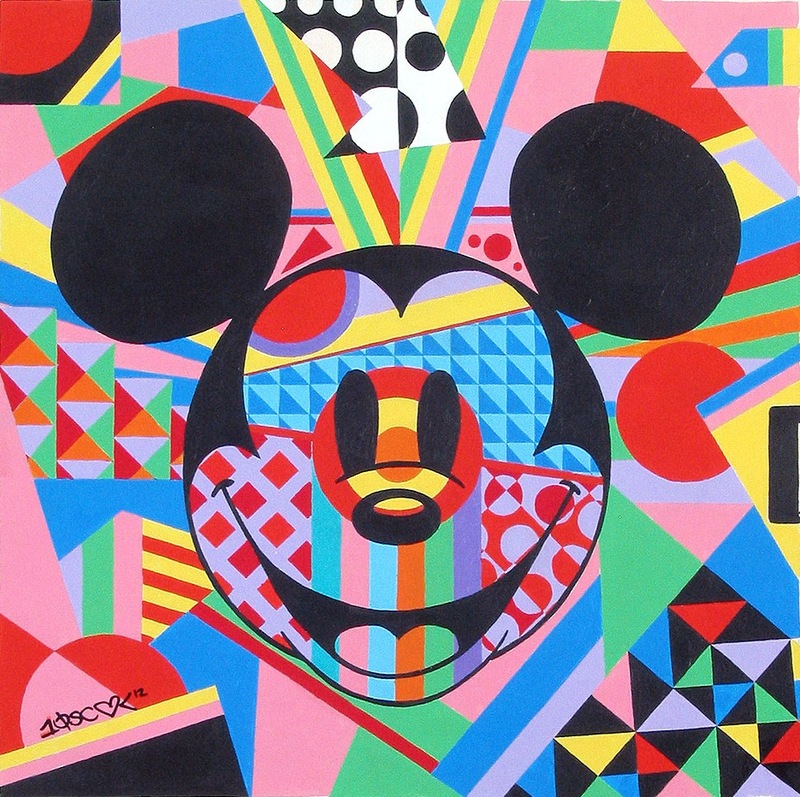 While the taxi’s honked and the people flittered about walking and talking below me in the city streets, I focused on creating a busy star splattered piece about Mickey Mouse. This piece is titled “Cerulean Alpha Centauri” based off the galaxy like splatters, was primarily done with Holbein Matte Acrylic labeled “Cerulean Blue”. This is number 45 in the collection, and falls under the “Contemporary Modern Series” for its Pollock like reference. Here is a little video I look about the process in New York City over this creation. While viewing the Yayoi Kusama retrospective and the “Fireflies on the Water” exhibit at The Whitney Museum in NYC, I had a chance to view their 2nd floor collection entitled “Signs and Symbols”. In this room I got to see one of my favorite art pieces of all time called “Laughing Boy Rolling” by Steve Wheeler. Mesmerized, I spent 45 minutes walking back in forth in front of this painting, while simultaneously gazing here and there at work of Ted Faiers that hung nearby. I was in heaven primarily because I was seeing for the first time the original works of a rare art movement. Steve Wheeler was an abstract expressionist that belonged to the sub group called the ‘Indian Space Painters’. While the term is contemporarily deemed politically incorrect, and rightfully so, this subgroup actually paid a positive homage to the cultural style and heritage of Native American art. Steve Wheeler, while born in Slovakia, immigrated to America as a young infant by his parents who were searching for a better life. They resided in New Salem, Pennsylvania, where his father worked as a coal miner in the town. At 16, Wheeler found himself working in his father’s footsteps in the same mines, and claims to have found his calling deep in the dark tunnels of his toiling labor. It was here that Wheeler heard the voice of an oracle deep in the mines telling him of his destiny to be an artist. Steve, now determined to reach this lofty goal, continued to work in the daytime as a coal miner, and educated himself at night as an artist in his small attic bedroom. 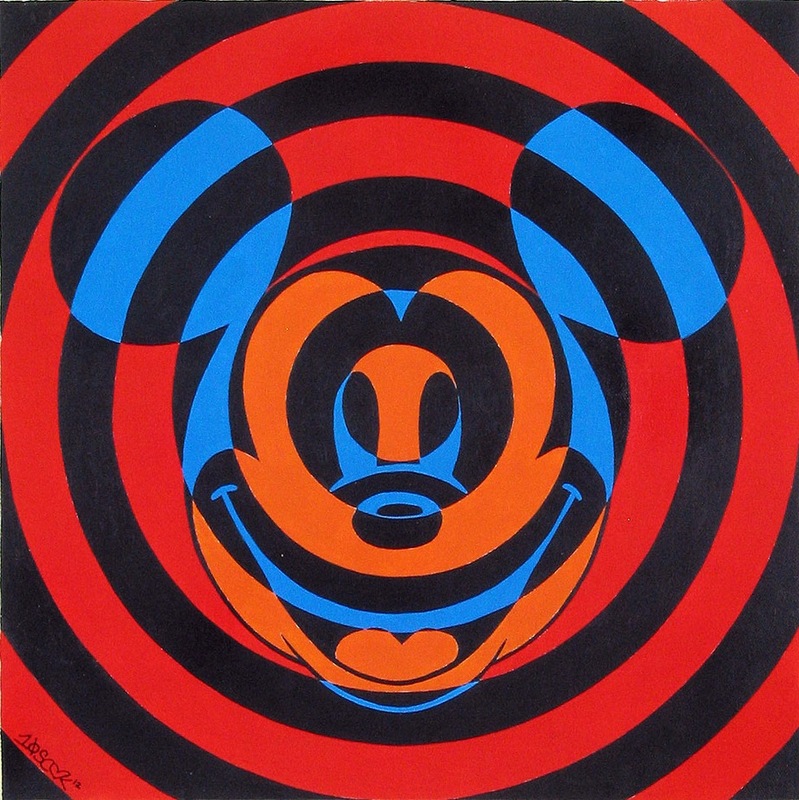 He then later moved to New York City, and dedicated the first half of his life to being a painter. Wheeler’s executions were geometrically sound and flawless, often going above and beyond in complexity of most cubist abstract expressionists at that time. His attention to detail combined with his clever merging of his influence of Northwest Native American art aesthetic made him a rising star within the small group of Indian Space Painters. He was known as an eccentric, often labeled as arrogant and sometimes even belligerent, but nonetheless a genuis. Wheeler spent the 2nd half of his life as a recluse and for 40 years until his death, he did not paint. I’m gathering that my obsession over Steve Wheeler had half to do with his incredibly complex and detail oriented work, and half to do with his life and his behavior. The 45 minutes I spent grazing like an obsessed buffoon in front of his work was mostly due to my imaginings of him creating his pieces. I wondered what was going on in his head as he was creating this particular painting. and more importantly, how he felt when he completed it. I flew back home to my studio in Los Feliz, and mulled around my drafting table for hours. I spent days drafting and redrafting my direction of this movement, consistently focusing and refocusing on my attempt to infuse Northwest Native American elements into an abstract expressionist piece. This is what emerged. This piece is titled “Abstract Space Invaders” in homage to Steve Wheeler and what I’d like to politically correctly called the “Native American Space Painters”. This is number 44 out of the collection and ties into the Contemporary Modern Series.